My web site has been going up and down over the night. I've intentionally been trying to elicit reddit traffic so I can test different parameters for apache server optimization, to handle high traffic over slow connections. A netbook can be ideal for a home web server. They are cheap, and use less power than a CFL light bulb. The only trade-off is that it won't reboot on a power failure. Fortunately, the built in UPS will sustain it through all but the longest power outages. My Via Artigo died several weeks ago while I was using it. I have no air conditioner, so it must have been about 30 degrees which may have contributed to its demise. I took it apart and poked at it, but the monitor and disk light wouldn't light up. So ended up getting a $179 refurbished Acer Aspire One, which is now happily serving up this web site. I turned it on briefly and it had a linux based OS on it that boots up in a less than 5 seconds and looks confusingly like Windows XP. Enough about that. Because I only install Ubuntu on USB keys, I was able to plug it in, boot up, and my web site was up and running in only minutes. The fan is the quietest I have ever heard on any laptop. It makes almost no sound at all. 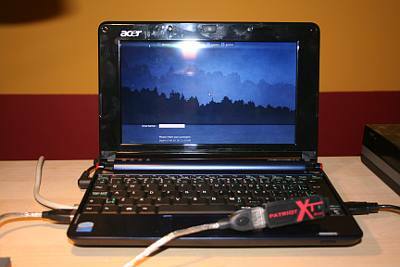 My old Artigo had a Via 1 GHz CPU and 1 GB of memory, and it could be used as a desktop system. Not so with the Acer. Even with the increased processor power, the decrease in RAM eats up all the benefit. After installing Xubuntu, the system is too sluggish to handle common desktop tasks. It badly needs a RAM upgrade, but this requires you to completely disassemble it.. The tiny speakers are junk. Imagine listening to a movie through ear-buds one metre away. That's how bad it is. But it doesn't matter, because it's a server. With Ubuntu 9.04, after a day of serving up moderate web activity, the Linux Atheros Wifi driver was stuck in a bad state so it was offline. I switched it to a plug-in cable and haven't had any more issues. The system went non-responsive an hour after I posted my last comic strip. It had a blank screen and needed rebooting. However, I hadn't optimized apache2 yet. Using the approriate settings, I believe that it can handle about between 30 and 40 visits/minute, or anything reddit and ycombinator can throw at it. I'm still tweaking with the apache parameters, and I'll post something about them soon. Ensure that MaxClients is set to a reasonable value (memory divided by 7 MB?) in your apache2.conf file. If you come home to find your machine non-responsive and thrashing, this is the cause. To be ultra-safe, you can flip the "KeepAlive" setting to Off, but your pages will load more slowly. If serving over a dynamic IP address, make sure your machine is configured to automatically update it. I installed ddclient to do this, but on Ubuntu it wasn't automatically restarting after a reboot. As always, be careful with large images. Save photos as low quality JPGs, and screenshots as 16-colour .PNG files. Don't put up anything over 50 kb. Thanks for this article! Glad to see I'm not the only one who sees the value in using my old Netbook as a server... I just did a similar write up on the merits of Netbooks for serving web requests... haven't gotten into tuning Apache yet though. Mine has 2 Gig of memory so I haven't seen any performance issues yet to speak of, even with using a portion of it for memcached. davidvhill.com/article/why-you-should-use-a-netbook-for-your-webserver if you are interested. I just found this post; I've been thinking about doing something similar. I don't see a search function here, is the Netbook still working as a server? you will probably get less latency if you upgrade the WiFi card (located under the touch pad when you disassemble) or use a cat5e cable instead of wireless. many things from lights, Bluetooth, microwave ovens, and people trying to connect to your network slow your network speed down. Apache is an absolute joke. Allocating a full thread stack for every request was the dumbest design decision ever made. Although I expect nothing less from the morons who also gave us Apache Ant. Boasting about how many 8MB stacks your tiny server can sustain is like boasting about how thick the lead walls are on your airliner's fuselage. Completely missing the point and utterly retarded. I use an Aspire One as a netbook pretty reasonably thanks to Ubuntu Lynx Netbook Edition and Chrome / optimised Firefox. I hadn't thought of using it as a webserver though, neat idea. Consider the SheevaPlug range though - designed for the job and an excellent product. Nikos: It's been working continuously for 11 months now. However, summer in my house kills equipment so we will see what happens! I have a way of switching things to a backup within a few hours if the Acer fails. cool idea. running web server on a laptop but what about the heating? I've got an aspire one that I also use as a home server. The memory upgrade is fairly easy and takes less than 10 minutes. I've upped the RAM on mine to 2GB. I also swapped out the crummy atheros card with a broadcom one I got off ebay. Highly recommend this change if you're serious about using it wirelessly! Very good idea using a netbook for a server. Save a lot on energy bills not to mention sound levels. Acer Aspire One Laptop AC Adapter for Sale,25% off! Three seconds isn't too long at all. There is plenty of text on my pages to read while the images are loading for two more seconds. It can handle twenty visits per minute? Are you talking about smoothed load? Does that mean your website has an average latency of three seconds? That's way too long dude. use lighttpd + php + apc or just add apc php cache. That will speed up your php scripts. Also try to add mysql caching and app level caching to disk. so spend £10 on a 1gb ram stick? Setting keepalive = 0 is not such a good idea. It means each image needs a new HTTP connection, which wastes bandwidth. I was able to have around 80 concurrent apache processes on a 128 meg VPS. The key is to do it without any server side processing. Rant: Why can't anyone make a good settings screen?